One of the most significant mistakes many creatives make is the failure to promote their work. You can have the best product in the world, the greatest app ever, or the most beautiful WordPress theme, but if you don’t showcase your work, you’ll never score big. A tight budget should not be an excuse. There are some marketing efforts you cannot ignore. One of the most effective promotion channels is video content. Do you know the saying “A picture is worth a thousand words?” Then how much is a three-minute video worth? Three minutes of footage multiplied by 25 frames per second increased by 1,000 equals … a lot. You do the math. Video content is taking over the web. 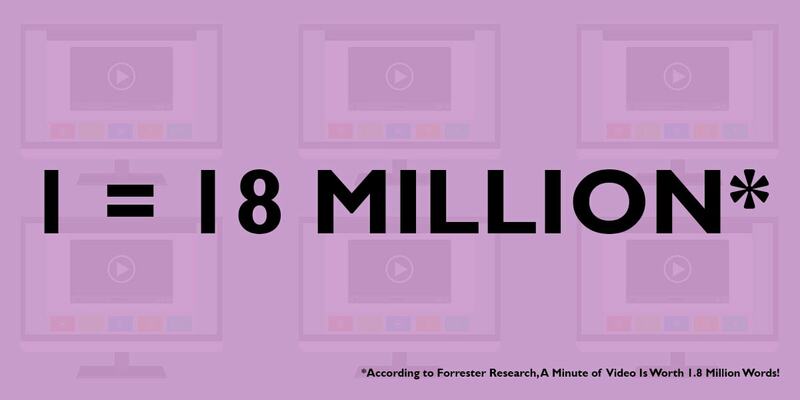 In 2019, video content will account for 80% of global internet traffic. More than 64% of consumers buy a product after they watch a video. One billion hours are spent YouTube daily. Apple overhauled its macOS App Store to feature video content for app presentations. These are the headlines you see every day on the web. Do you see a trend? There is no recipe for perfect video content. It depends on what you want to achieve, what type of video content you want to create or what is your target audience. However, most videos have one thing in common. 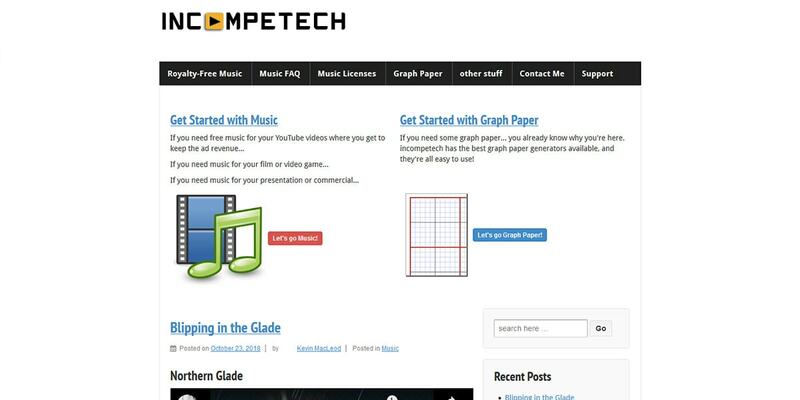 Whether you are creating a demo video, a tutorial or a presentation, you need music. Now imagine you just finished your promo materials, upload them to YouTube, your first customers are already downloading products, five stars reviews are flooding, only to have YouTube suspend your channel. Or, even worst, imagine that after your 665th sale, you receive an e-mail with the subject line: Copyright Infringement. This is a scenario that could happen if you are using copyrighted music WITHOUT AN APPROPRIATE LICENSE. Hey, but you’ve got that music or sound effect from a website giving away them for free. You are covered right? Your favorite blogger even recommended this site in his “70+ websites to download free music” blog post. Well, most “free music websites” have a disclaimer and, probably, an indemnification clause that absolves the site owners of any liability and any obligation whatsoever to check the licensing state of the *mp3 file you downloaded, and your favorite blogger is busy writing his next article (possible topic: top 70+ copyright lawyers). This is an unexpected turn of events. The most important thing you should know about copyright, music and downloading is that most of the time when you download a song from a legitimate source, you license it. Yes, you don’t own it. Anyone with the same license as you can use it. The only way you get exclusivity is either via an exclusive license or when you get the copyright transferred to you. CC0 1.0: Universal Public Domain Dedication. No copyright applicable. Usually, the copyright owner dedicated the file for public use, or the copyright itself expired. You can download, use, remix, share, and do anything else you want without having to credit the artist. CC-BY 2.0: Attribution Generic. Just like above, but you must provide an attribution link to the original artist. CC-BY-SA: ShareAlike. Anything that uses the piece of music licensed this way should be made available under the same license. CC-BY-NC: NonCommercial. You can’t use this audio-file in anything that’s intended for commercial gain without written permission from the artist. CC-BY-ND: Attribution-NoDerivs. Any audio file released under this license should not be remixed in any way, including using it as a soundtrack to a video. So, if you are looking for free sounds, these are the licenses you should look for. We have a handpicked list of CC resources that’s a great place to start. Free Music Archive should be your first check. Launched in 2009 by WFMU, The Free Music Archive is an interactive library of high-quality, legal audio downloads. 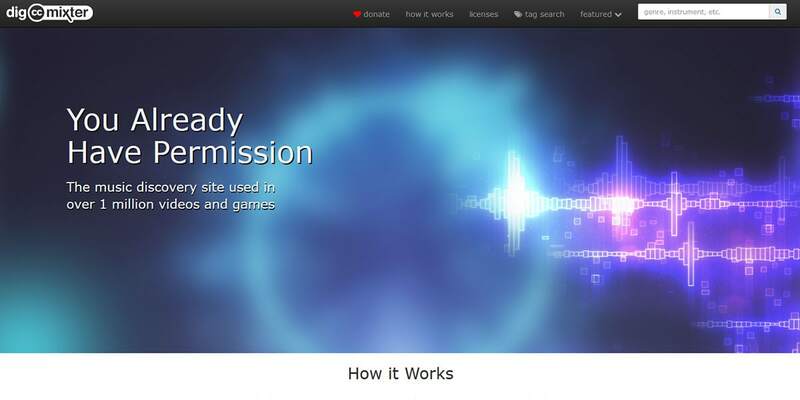 Unlike other websites, uploading content is granted only on an invitation basis and all audio files are hand-picked by one of the project’s curators. Files are grouped in 16 style genres, and each style has its sub-genres. A nice touch is the blog section where you can discover tracks to draw inspiration from. Of course, there is a charts section – featuring the most popular files, a track of the day widget, a recently added widget and more. Free Music Archive is not only a repository of free files, but it’s also a platform for artists to showcase and promote their work. Each artist has it’s own page on the platform with bio and links. If you like what you hear, you can always donate via the tip button. The site is not as mobile friendly as you would expect, but the iOS and Android apps are a good alternative. Pay attention to the license box next to each track. While most tracks feature a Creative Commons license, some use an FMA license restricted to personal use. There is no easy way to sort for commercial use licenses, so take a close look at any song before using it. You already have permission. This is the moto ccMixter features on its homepage. A clean and responsive interface will help you navigate ccMixter’s impressive collection of sound files. There are three main categories to choose from: Film and Video, Commercial Projects and Video Games. You can navigate files via tag search. Choose genres, instruments or style to narrow down your search. Also, don’t forget to filter for the license you need. While ccMixter has no problems with quantity, it does have some issues with the quality of the files uploaded. Not everyone has the latest tools, inspiration or skills to produce high-quality music, so you’ll spend some time here to find a suitable track. The entire ccMixter sound collection is available under an attribution license. As long as you give credit to the artist, you’re free to use it for whatever project you have in mind. FreeSound is a project founded by the Universitat Pompeu Fabra of Barcelona and aims to create a collaborative database of audio snippets, samples recordings. Being a community-driven project, FreeSound has an excellent forum board with thousands and thousands of threads. Review sounds, get feedback on submissions, post requests, showcase projects and browse a legal and attribution section forum. 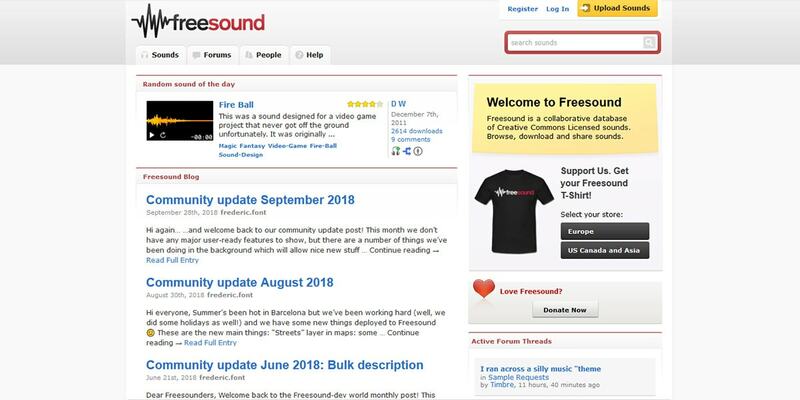 FreeSound is the definition of a community project. While, at the first glance, the UI seems antiquated and unintuitive, you’ll get the hang of it in minutes. The best way to start is via the search bar and work your way around from there. No matter what kind of sound you need, you’ll find it. Each file has a specification box with info on the license, type of file, duration, size, bit-depth, channels and sample rate. Next to each file, you’ll find the three types of licenses available on FreeSound: zero (CC0), attribution (BY) and attribution noncommercial (BY-NC). While Incompetech’s music database is much smaller than FreeSound or ccMixter, you’ll appreciate the granular filtering capabilities. In addition to genre, tempo or length, you can also refine your search by “feeling,” which should help you find the perfect track for your project. You can preview the track on the site and download it as *.mp3. All the files on Incompetech are available under a CC-BY license, but you have to either credit the author. If attribution is not wanted or impossible, a commercial license is available. 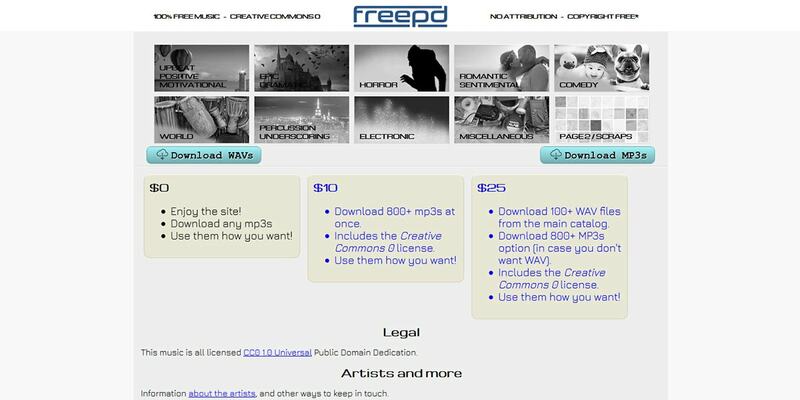 FreePD is a repository of music and sound released under a public domain license. There are 800+ files to choose from in eight categories. You can download them at once for $25. Remember, this is not a license fee; you only pay for the commodity of a single download. FreePD is maintained by Kevin Macleod, also behind the Incompetech project, so many of the tracks you’ll find here are his creations. Founded in 2012, Musopen is a non-profit website that hosts music recordings, music sheets, sounds, apps and even educational materials without copyright restrictions. Musopen is on a mission to offer free music to anyone. Unlike other websites, Musopen is focused on classical instrumental music and covers various musical themes such as Baroque, Classical, Medieval or Renaissance. Navigating the extensive catalog is easy either by using the navigation menu or by typing a keyword in the search bar. All files can be previewed online, downloaded or bookmarked for later. Up to five items can be downloaded per day. Those who need the download limit lifted or want to support Musopen’s mission to offer free music to anyone, can upgrade to paid memberships. Memberships come with lossless formats, music requests and unlimited downloads. 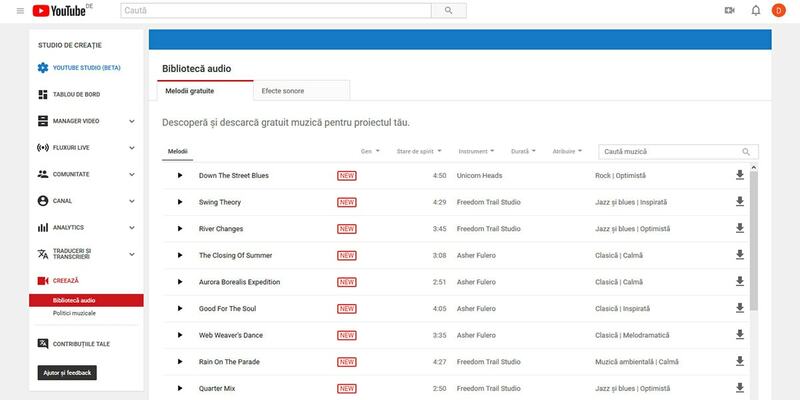 The Youtube Audio Library is an extensive curated library of permissible license audio files that you can use on the platform and outside it. The library has two big categories — free music and sound effects. Furthermore, a filtering system is available to sort by genre, mood, instrument, duration or attribution. The download format is an 320kbs bitrate *mp3. CC defines noncommercial as “not primarily intended for or directed toward commercial advantage or monetary compensation.” While the definition may seem vague, it was specially designed this way, to protect both the licensor and the licensee. When in doubt, look for a commercial permissible license, ask the licensor for an exemption or pay for the commercial use. In some legislation, the legal doctrine may cover some use case scenarios as fair use, meaning that you could still use CC-BY-NC audio on commercial websites, but, do you want to deal with a possible violation of copyright laws? For example, in 2014, Deutschlandradio, a non-commercial broadcaster in Germany, featured a cc-by-nc photograph on its website. The author sued Deutschlandradio and won on the basis that, in German law, non-commercial use means personal use. While the broadcaster is indeed a non-commercial organization, the business model alone was not enough for an exemption. If you want to be safe, you should only use CC0 or CC-BY licensed music. For any other license, carefully check and follow the requirements. If you are in doubt get in touch with the artist or with a lawyer. Better safe than sorry. While most of the time you’ll get an e-mail requesting a takedown of infringing content, there is always the possibility of legal action. Trust me, you don’t want to deal with it. You can also pay for a commercial license. There are plenty of libraries where you can get high-quality music and sound effects for a reasonable price. By doing so, you will reward creators for their efforts and encourage them to create more content. Of course, you can do the same for authors that share their works under CC licenses. Most of them probably accept contributions. So, if you have any question on the topic, know a great CC library that I’ve skipped or want to showcase your videos, drop a line in the comments.